Let’s consider an example where we lower the carrying value of inventory using the net realizable value less a normal profit margin method. Consider a sporting goods company owns shoes worth $13,500 at December 31st, 2009; these shoes have a selling value of $15,000. The estimated cost of bringing these shoes to its stores for resale is $300 and a normal profit margin is 20%. How do we determine “market” in such a case? Let's consider 2 scenarios where in i) Market equals Net Realizable value and ii) Market equals net realizable value minus a normal profit margin. If market equals the net realizable value alone, then we see that with an original purchasing cost of $13,500, there will be a $1,200 gain reported on the income statement, in the form of reduced cost of goods sold ($13,500 - $14,700) because instead of reporting Cost of Goods Sold of $14,700 which is the market, we will recognize the original purchasing cost of $13,500 as COGS and deduct this from Net Sales. 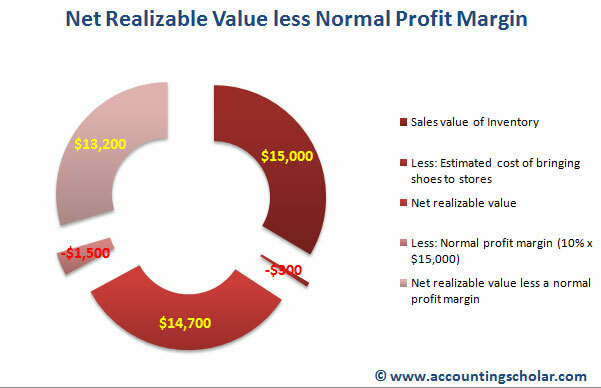 In 2011, when we record $13,500 as the cost of inventory (due to lower of cost or market with cost being lower at $13,500), we will realize a gain of $1,200 on the shoes inventory after deducting the cost of resale of $300.